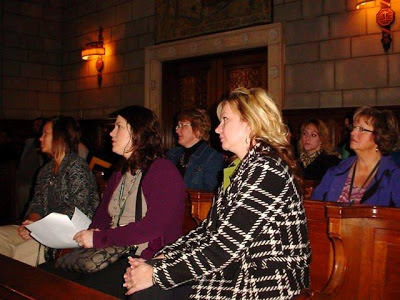 The 2012-2013 Odegeo...Leadership for Fillmore County class traveled to Lincoln on February 13, 2013 with the Leadership Hastings class to the State Capitol to learn more about the Unicameral and the issues in the Legislature. The Leadership groups began their day with Chief Justice Heavican presenting information about the Nebraska court system. Next Kate Heltzel from the Unicameral Information Office gave an over of the unicameral. The group then had a tour of the Capitol building. The group then planned to observe the Legislature in session, however, the Legislature adjourned just as the group was planning to enter the gallery. According to the Sargent at Arms this is quite unusual for the Senators to adjourn at 10:00 a.m.
Walt Radcliffe presented information on the role of lobbyists in the unicameral. He explained how organizations and interest groups hire them and how they present information and their client’s viewpoints to Senators. During lunch Senator Karpisek, Senator Sieler, and Senator Hadley spoke to the group about how Senators work together to get legislation passed or eliminated. Members from the Fillmore County leadership group asked the Senators their views on the LB561 which proposes to close the YRTCs and LB405 and LB406 which would change taxing methods. First Lady Sally Ganem also attended the luncheon and told about the roles she plays as First Lady. She also talked about Governor Heidemann and how he works with the Senators. In the afternoon the class members attended committee meetings. The day ended with a tour of the Governor’s mansion.